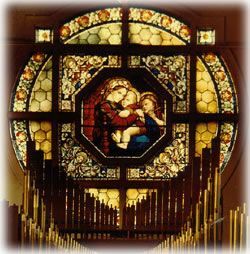 In back of the church, you will see the Rose Window, Raphael's Madonna of the Chair, which was added to the church in the 1913-1920 renovations. 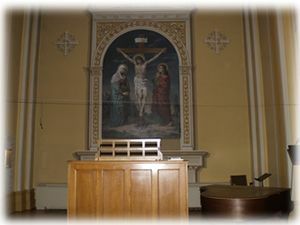 The present organ in the church was added in October of 1972. It is felt that the organ came from a parish in Missouri and was used by that parish from 1951 to 1956. The organ was new about 1947. This Kilgen Organ 7311 (7400 revised) was rebuilt for Saint Mary's Seminary by the St. Louis Organ Company. The detached console is of light finish oak wood. This beautiful instrument contains: Great Organ, Swell Organ, Pedal Organ, and Couplers; 714 pipes are from the original tracker organ which was in the Sanctuary choir loft. This concludes the Tour of the Shrine Church. If you wish to have a more extensive tour of the church and you are in the Perryville area, please drop by. Once you are here and you want any questions answered feel free to come to the gift shop or ask a tour guide in the church. The gift shop is open for guided tours of the church during the week at 10:00 and at 1:00 Monday through Friday. On Saturday and Sunday at 1:00 and 3:00 guided tours start in the church. No tours on church Holy Days and most legal holidays. Thank you for your time and come again for another visit. The church is always open year round and closes at dusk. Mass is at 11:00 a.m. on Sundays and 8:00 a.m. Monday through Saturday. Only exception is Midnight Mass on Christmas. Miraculous Medal Novena with Mass on Monday at 7:15 p.m.